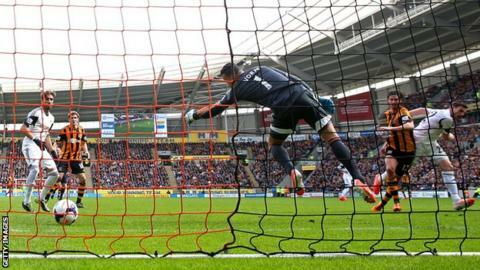 Swansea City defender Angel Rangel says their 1-0 loss at Hull City was a missed opportunity to banish any lingering relegation danger. Despite Saturday's defeat, the Welsh side are still six points clear of the Premier League drop zone with five games remaining. "We knew other teams around us were playing against each other," Spanish full-back Rangel said. "So it was a good chance for us to get some points on board and move forward." Hull also began the game looking over their shoulder but George Boyd's header after 39 minutes saw the Tigers rise to nine points above the relegation zone, realistically if not mathematically safe. Instead it is Swansea who must continue hunting down the crucial points to ensure they continue next season in the Premier League. "Especially in the first half we know that we didn't play our best football and we gave away a sloppy goal, which is always disappointing," Rangel added. "We've got five games left and we just have to go and try and win as many as possible. "We know we are not safe, I said it last week after the win against Norwich. "So we still have plenty of games against teams like Aston Villa, we've got Southampton, Chelsea next which is going to be a tough one. "But we've got that chance, we know it's in our own hands and we can win games, especially down the Liberty Stadium we've got three left and that's going to be three very important ones for us. "Really we have to go game by game and see what happens but the next couple are going to be vital, really really tough for us."